Buying a home is a dream and in today’s times, easily achievable with a home loan. Everybody with a home loan knows the importance of an EMI, but let’s start with some of the basics including understanding the EMI and using a housing loan EMI calculator. A home or housing loan is the amount of money you borrow from a lending institution like a bank or NBFC to buy a home for yourself to live in or as a future investment. The loan amount sanctioned is usually about 70-80% of the home’s value. You are required to pay back the loan amount along with the interest accrued in monthly installments. An interest amount is levied on the home loan amount, and the entire principal and interest amount have to be repaid to the lending institution. Mostly, the repayment is made as an equated monthly installment or an EMI, and the online calculator uses formulas to calculate how much a borrower is liable to pay month-on-month. A home loan calculator is an online tool available to all. You input personal details in the calculator such as the loan amount and the interest, and you get the equated monthly installment (EMI) for the tenure. You can use the calculator to make an informed choice and meet your financing goals. The tool will help you realize the most suitable repayment amount based on your eligibility and requirement. Buying a piece of land – As the name suggests, if you are interested in buying a piece of land, vacant or occupied, you can avail a home loan. You can get a loan amount of 70-80% of the property value. Home loan for construction – If you are planning to construct your own home on a piece of land, reach out to a lender for the loan. The property may be used as collateral. Buying a builders house or apartment -In many modern cities of the country, populations are now buying ready to move in apartments, flats and houses. Most developers and builders tie-up with lending institutions, making it easier for their customers to get a loan. Home improvement or renovation loan – If you are looking to get your home renovated, then you can opt for this loan. Some companies offer it under the umbrella of home loans while others keep it under personal loans. NRI Home Loans– As the name suggests, these loans are designed for the NRIs or Indians residing in foreign countries. Terms and conditions of the loan will vary from the home loans for resident Indians. Other loans that you can avail are the Balance Transfer Home Loans (to change lenders), Bridged Loans (for the purchase of a new home) or Stamp Duty Loan (covers the cost of stamp duty with a loan). As long as you meet the eligibility criteria and have the EMI repayment capacity, you can avail any one of the above. Formulas to calculate the exact amount differ for the housing loan interest calculator and the excel sheet. the present value of the loan (t). By using the above formula, you will get the same result that you will get in the Excel spreadsheet. The variables will have a significant impact on the EMI amount. Another unique calculator is home loan prepayment calculator. It gives you the option of increasing your EMI payment each month which is deducted from your principal. This results in big savings over a long-term tenure. Your housing loan can also help you to save taxes on your income. Every principal and interest payment made against can be claimed for deductions in your income tax. Use a home loan tax benefit calculator to calculate benefit that you can claim in the income tax by buying a home. Home loan repayment calculator helps you to find out your estimated repayments. This calculator can also be used to generate a Key Facts Sheet with principal and interest period. Principal or loan amount – Most home loans are sanctioned for 70-80% of the cost of the property. The higher the cost of the property, the higher will be the monthly installment. Interest Payable- Every lending institute charges an interest on the borrowed amount. A small variation in the amount can lead to large savings. It is a good option to research all lenders, before getting a principal amount sanctioned. Keep in mind the interest rate can change during the tenure, and you should communicate with your lender regularly to keep yourself updated. Loan Tenure – The amount borrowed and the interest accrued have to be repaid in a fixed time. It is given in years, and can range from 3-20 years. CIBIL Score – The credit or CIBIL score is a reflection of your repaying capacity. A score above 750 is considered good. It gives you the leverage to negotiate for a lower interest rate. Your Eligibility– Every lender will have their own eligibility criteria based on the type of housing loan, which may include age, income and area of residence. Carefully read the criteria to know if you are eligible to apply for a loan. A rejected loan application can reduce your CIBIL score. Loan Repayment – In the course of repaying the loan, if you inherit, earn or save enough amount to make a prepayment, you can do so. You will have to discuss with your lender the terms for foreclosure of the full loan, or prepaying a lump sum amount and drastically reducing the principal amount and tenure. Change your lender – Your EMI will be affected if you change your lender mid-tenure. The lender could offer you a lower interest rate or a wider tenure. In both the cases, your home loan EMI reduces, making it easier for you. Though the tool makes it easy for you to calculate your EMIs, you should also know the various benefits of using the EMI Calculator. 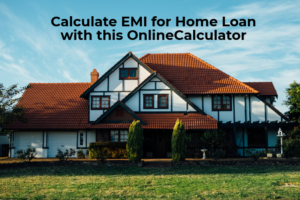 Convenient and fast calculations: Home Loan EMI Calculator provides you with the ease of making calculations with speed and accuracy. Within seconds you can work out the EMI of your home loan by using this computing software. Specific for each loan: One of the major advantages of using the online calculator is that it is specific to each type of loan the borrower is looking for. You will get information related to a home loan if you are using a home loan interest rate calculator. Just remember to input the correct values. Graphic representations: It also provides graphic information and presents a pictorial representation of all data points like principal outstanding, the rate of interest, time remaining etc. Your contribution towards principal payments. Outstanding balance before and after each EMI payment. Remember, each calculator uses a formula and if there is an error in the data shared, the EMI calculated would be incorrect. It also should be kept in mind that the calculator gives a figure which is quite near the final EMI the borrower is expected to pay. However, it is the financial institutions who can calculate the EMI amount to the correct paisa. Why should I use an online EMI Calculator? You should use the online EMI calculator to make an informed decision – the calculator can be used multiple times with different principal amounts and tenure to check the EMI. This helps you calculate the EMI which you can pay without any financial burden. What is the cost of using a home loan calculator? There is no cost for using an EMI Calculator. You can use it as many times as you want. How accurate is the EMI Calculator? The EMI Calculator used inputted algorithms to calculate the EMI, and hence is highly reliable. But, in some cases, it may not input processing fees, or benefits offered under schemes. Hence, for the exact figure, it is always better to ask a representative. Can I use the calculator to calculate EMIs for different banks? The calculator does not ask the name of the bank, and hence, you can use it calculate and compare the EMIs of different banks. 1)EMI – An equated monthly installment (EMI) is an amount fixed by a borrower for the lender. This amount is to be paid on a specific date each month with the aim to repay the home loan. These include both interest and principal over a specified number of years till the full loan is paid. 2) Online Calculator – It is calculated directly from the computers numerical keyboard or mouse. Clicking on standard calculator displays the online mathematical calculator. This is available online free of cost. 4) Repayment – It is the payback money by the borrower to the lender. It includes part of the principal amount and part of interest amount and is made periodically or in full. 5) Tenure – The duration for which the loan amount is sanctioned is known as the tenure of the loan. It may vary from 1-20 years depending on the type of loan and the EMI payment capacity of the borrower. 6) Banks – Banks are financial institution licensed to deal with money and its substitutes by accepting time and demand deposits, making loans, and investing in securities. They generate profits from the interest rates charge and paid. 7) NBFCs – These are Non Banking Financial Company (NBFC) registered under the Companies Act, 1956 of India. Like banks, these are also engaged in the business of loans and advances, acquisition of shares, stock, bonds, hire-purchase insurance business. 8) RBI – The Reserve Bank of India is India’s central banking institution. It controls the monetary policy of the Indian rupee. It commenced its operations on 1 April 1935 in accordance with the Reserve Bank of India Act, 1934. 9) Pre-EMI – In some cases, you may buy a flat or home which is still under construction by the developer. In such cases, the principal amount is disbursed in different stages. You are required to pay the EMI on the interest part of the loan. The period before you start repaying the principal amount is known as Pre-EMI. 10) PMAY – Pradhan Mantri Awas Yojana is a scheme designed to address the gaps in the rural housing program and strengthen the government’s commitment to providing ‘Housing for All’ by 2022. MCLR – Marginal Cost of Fund based Lending Rate is the internal benchmark rate used by banks to fix the interest rate on floating rate loans. Since 1st April 2016, all Indian banks are required to benchmark and price their loans to MCLR. The RBI has set the guidelines for MCLR that all banks are required to follow.